On Friday 20th Nov, Boat to Row play at the Hare & Hounds (Kings Heath) with support from Dancing Years, Declan McKenna + DJs from Goodnight Lenin. Doors open at 7pm (last entry 10pm) with advance tickets charged at £10 – as presented by This Is Tmrw. For direct gig info & online tickets sales, click here. 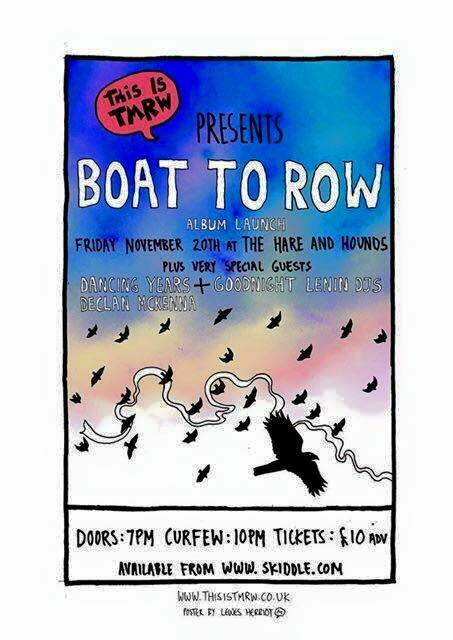 Boat to Row are coming to the Hare & Hounds to celebrate the launch of their debut album, I Found You Here – released via local label/promoters, Nocturne Records, on Friday 20th November. Hence the shindig. And with support from Leeds’ debut EP impending Dancing Years (Learn to Kiss – Feb ’16) and the Pilton funded precocity that is Declan McKenna, this is a pretty full bill for a tenner; some strong and promising voices. But, perhaps, more so if you like singer/songwriters and Folk. Think singer/songwriters and Folk. It’s going to be singer/songwriters and Folk. But she’s arguably not the only one, with Boat to Row earning a reputation for multi layered and considered compositions, driven by a campfire sealed narrative and winsome delivery. People like ‘em, in a nutshell. They’re, like, well cool. And now with an LP to shout about, a ‘labour of love’ which was reportedly two years in the making, the Birmingham multi instrumentalists are out on the road with their fresh stocking filler suggestion – playing at the Hare & Hounds (20th Nov), before heading to London (The Finsbury – 22nd Nov) and Nottingham (The Bodega – 25th Nov). So dip your finger in the sugar bowl and see what you think; try before you buy, watch the official video to ‘Turn the Page’ – taken from Boat to Row’s debut album, I Found You Here. And if anyone can corroborate, the site of the ‘TESCO LIES’ in Stirchley, right…?